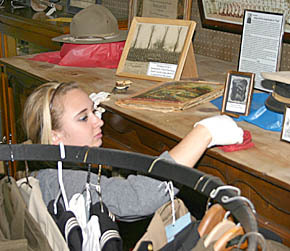 Some 37 Boone Central FBLA members provided labor for a variety of maintenance and cleaning projects at the Boone County Historical Museum on Thursday evening, Sept. 20. The museum is now entering its fall season, and will be open on Saturdays and Sundays, 1 to 5 p.m., through October. Above, student Rachel Lee cleans the top of a cabinet during the work sessin.